Selena Thinking Out Loud With Purpose is excited to introduce this new giveaway! There is nothing like getting rewarded for what you do on a daily basis. If you enjoy getting paid to shop online, take surveys, or for completing offers, then CashCrate is for you. Personally, completing a 1 month free trial offer of Netflix, helped me to become a continued customer. If I didn't find this offer online, I wouldn't be using Netflix as often as I do and enjoying the great movies and shows. Offers are a great way to learn about new products and services that you may want to implement into your everyday life. 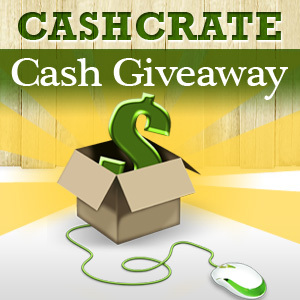 You can join CashCrate for FREE and also to celebrate their great success, below is all of the information about the $100 PayPal Cash Giveaway. Giveaway ends: June 5, 2013. Must be 18+ to enter. Open Worldwide. Co-hosts Ultimate Coupon Club and My Sweet Savings. use it for whatever you would like! But even if you don't win the $100 Paypal, you still walk away from this giveaway a winner. How? You have the opportunity to join Cashcrate FOR FREE! CashCrate is one of the best survey/offer sites on the internet. "I've been a CashCrate member for almost 5 years now, and get a check every month. Its not a ton of money, but its enough to go out on a date night with my hubby, or if I saved it each month we'd be able to do all our Christmas shopping. I love CashCrate as the program is simple, they pay on time, and best of all, its totally free!" This is one program you don't want to miss. Its simple to get started, just click here to join CashCrate. Please use the Rafflecopter below for your chance to win $100 Paypal cash! Disclaimer: Selena Thinking Out Loud With Purpose may receive affiliate commissions from your participation in CashCrate, though all opinions are my own and I would not recommend a product or a service that I feel is not beneficial to my readers. Thank you for your support of this blog. With $50 extra dollars a month, I could afford to fill more of my prescriptions. I would buy a movie and save the rest. Pay off the mortgage faster.